At its most basic level acne flare-ups begin when abnormal flaking of skin cells inside a hair follicle occur causing a plug. Hair follicles exist on virtually all skin except the palms of hands and soles of feet. 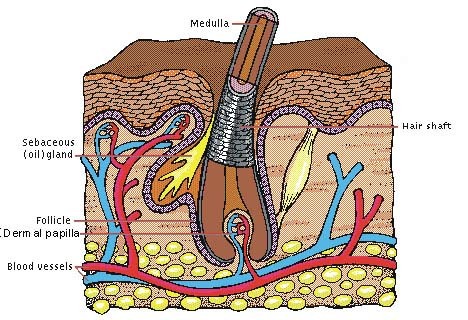 The hair follicle extends up from the deep layers of the skin and comes out of a pore. Near the surface, the oil gland (sebaceous gland) enters the hair follicle where it empties oil (sebum) at a relatively constant rate. The sebum lubricates the skin to prevent drying. Skin on the face, chest, and back has an especially large number of sebaceous glands. These are the areas where acne occurs. Other factors in this process are hormones which can increase the likelihood of plugs forming and bacteria which cause additional irritation and inflammation after the follicle ruptures. Hormones called androgens which are present in both men and women do two things: first they enlarge the sebaceous glands in the skin; second, they cause these glands to increase sebum (oil) production. This adds to the likelihood of a plug forming. As the plug of dead skin cells and excess sebum is exposed to the air it turns black (blackhead). If the plug enlarges it can cause a rupture of the hair follicle which then spills its contents of oil and debris into the skin leading to swelling and redness (inflammation). This is where bacteria that normally live on the skin make the situation worse. The bacteria known as Propionibacterium produce substances that cause redness and irritation. They also make enzymes, which dissolve the sebum (oil from oil glands in the skin) into irritating substances furthering the inflammation. Open for discussion is whether some foods like red meat, sugar and chocolate and certain pore clogging cosmetics enter the equation. Some research indicates they do factor in other research says that is a myth. WebMD points out that "acne is unknown in so-called "Stone Age" societies. On the other hand, it affects up to 95% of adolescents in industrialized societies". I think that clearly shows that a Western diet may be a major factor in the development of acne. Consider all these factors when looking for patterns of flare-ups and form your own judgments. Benzoyl Peroxide oxygenates skin. Acne bacteria cannot live in oxygenated environments. Benzoyl peroxide is also a mild drying and peeling agent which keeps pores from clogging. Unfortunately, Benzoyl Peroxide is also a toxic chemical which can cause additional irritation. Salicylic Acid is a beta-hydroxy acid that encourages the sloughing of dead skin cells, increases cell-turnover and helps unclog pores. Unfortunately it too can irritate skin and may only be used at the lowest possible concentration. Antibiotics can be used to kill the bacteria. However its like using a flamethrower to light a candle. Overuse of antibiotics often has bad side effects and weakens your bodys natural immune system leading to other illnesses. Hormone therapy estrogen helps balance the effects of androgens. Adult women and teenage girls may want to try hormonal therapy. However, it can lead to cancers, mood swings and other emotional issues. The Natural Way - the best and final option is to seek out a natural chemical free product that helps your skin achieve its healthiest possible state without further irritating it. Pure Emu Oil for Acne - How does it work? Emu Oil is a strong anti-inflammatory and will reduce redness and inflammation of already occurring acne. Emu Oil contains hormones which increase blood flow and oxygenation at the cellular level and high levels of Omega 9 which assist in penetration of cell walls to allow oxygen to enter and toxins to be released. It does not clog pores, nor will it foster the growth of bacteria, viruses or fungi, and is hypoallergenic. Emu Oil has been shown to accelerate the development of new skin cells by delivering the necessary bio-nutrients deep into skin where new cells form and reduces the buildup of scar tissue. All of these functions assist the skin to work properly and stay healthy. Finally, Emu Oil naturally helps to repair scar tissue, so as well as helping to clear your acne, Emu Oil will also help to repair previous scar damage. If areas of acne are severely inflamed you may want to consider emu oil based products enhanced with natural and botanical compounds which also reduce inflammation and kill bacteria such a Redness and Blemish Control.This product uses the natural anti-inflammatory properties of Pure Emu Oil as well as it's ability to encapsulation the additional ingredients and deliver them through the skin into the affected tissue below.